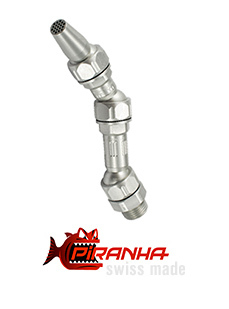 PIRANHA Cooling Line is a robust and versatile system for precise coolant feed, made of high-strength anodized aluminum, which can be used at pressures of 5 - 80 bar. 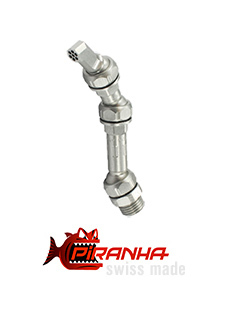 PIRANHA Cooling Line is avail­able in ½ and ¼ inch and can be mounted on all standard tool carriers with the available threaded fittings. In addition to the cooling lubricant supply, the PIRANHA Cooling Line system is also suitable for blow-out and vacuuming, but also used at low pressures, where other KSS pipes wear prema­turely, for example by very hot chips or spiral chips. IBT Thiermann is the exklusive distributor for the swiss manufacturer PIRANHA CLAMP in Germany.